The theatre company Third Stage was formed in 1983 by a group of drama dabblers who wanted to see life in Singapore played out on the local stage in all its glory and decay. They felt that drama in English in post-colonial Singapore had arrived at its third stage of development. They traced the first stage of English drama to colonial days when British personnel formed the major patrons and players, and the plays were accordingly British. The second stage, in the 1960s, saw the formation of the Experimental Theatre Club with the aim of encouraging the staging of local works. Although foreign plays continued to dominate the scene, the casts were fast turning multi-ethnic. The trend took another turn in the 1970s when English-language playwrights drew inspiration from the modernising society, and high-rise living, family conflicts and changing social norms became common themes. This ushered in the third stage of theatre development which marked the growing importance of the search for cultural identity and the telling of stories grounded in the Singaporean imaginings. Third Stage was formed by 10 friends who had been active members of students’ unions in Singapore and British universities in the 1970s. In the students’ unions, drama was both a creative recreation and medium for social discourse. Third Stage, therefore, served as part of a continuum of the founding members’ pursuit of critical leisure. The theatre company saw that it could play its part in performance art that goes beyond the mythologizing of the East as an exotic and inscrutable throwback to the 19th century. It did so by creating works based on the present context and members’ musings of lived experiences. The attempt to faithfully portray the coffee shop Ah Pek and our next-door Bee Lian, (without irony), led to the organic use of Singlish, but members were mindful of not turning it into a gimmick or kitsch. Today, few stand-up comedians are able to provoke a laugh without speaking Singlish, and it is used liberally in social dramas on stage and TV, resulting in some critics complaining of its gratuitousness and over-use. But in the theatre scene of the early 1980s, it represented a milestone of sorts in its recognition of and relevance given to the local vernacular. Singlish also added an important dimension to Third Stage’s exploration and representation of the Singaporean identity: its concerns, creative spirit and quirkiness. 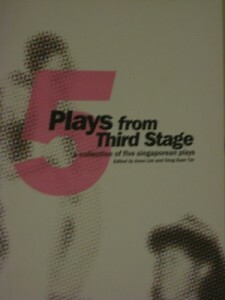 Third Stage was at its most productive from 1983 to 1986, staging a total of eight plays, all written and developed by its members, on issues and themes that affect Singaporeans, such as the graduate mothers’ scheme, education policy, in particular the destructiveness of the early streaming of school children, marginalisation of the lower-income and foreign domestic workers. Literary critics might consider the plays counter-discourse to Singapore’s nation building. Because of the group’s predilection for creating plays that depict human frailties and destabilising official narratives (such are the staples of any number of theatre groups in the world — with the exception of some dictatorship regimes), it was considered a security threat in the insecure minds of the government. Meanwhile, the mid 1980s saw the emergence of the then fledging civil society. Political parties, such as the Workers’ Party and the Singapore Democratic Party, had gained a toehold in the erstwhile one-party parliament. The Law Society was injected with new blood and saw a group of lawyers questioning undemocratic legislations such as the Newspaper and Printing Presses (Amendment) Bill. The Government wanted to introduce the bill to restrict the circulation of foreign publications it deemed to have engaged in domestic politics. Several groups under the Catholic Church, following its teachings, adopted an outward orientation beyond personal salvation in their work, which took them to witness and report on social justice issues. They were a thorn in the flesh of the paranoid government which then responded quickly before that thorn had a chance to grow. In 1987 the Internal Security Department (ISD) arrested 22 people and accused them of being involved in a “Marxist conspiracy” to overthrow the Singapore government. Of the 22, four were key members of Third Stage: Wong Souk Yee, Chng Suan Tze, William Yap, and Tay Hong Seng. Thus while negotiating the slippery path of critical dramaturgy, these members fell into a dark ravine of detention without trial. The four members were detained from seven to 15 months on the allegation that they used Third Stage as a front to subvert the social and political system of Singapore. This was despite the fact that all the plays produced by Third Stage made the cut at the censorship board (with a few even receiving monetary grants from the then Ministry of Culture) and were performed in a public venue. On the artistic plane, Third Stage members had good stories to tell but many were still in the midst of honing the art of telling them. They were said to have the zealousness of the Crusaders, and little was left to the imagination. But the audiences were forgiving, as Third Stage was like a breath of fresh air in the wake of esoteric plays written by dead white males, plays which only literature undergraduates could endure. The comic-tragedy of living in a city that is perpetually under construction, that decides for you what language you should speak, who your neighbours are, whom you should marry and how many children you should have, resonated with the audience. Also, the use of Singlish, unlike the convoluted monologues of damaged souls, endeared the plays to the audience who would otherwise watch TV. The ISD detention of the five Third Stage members certainly dampened the morale of the group, not to mention striking fear into the hearts of members and audiences. Third Stage became quite dormant after the macabre 1987 dragnet. They put up two more productions in 1988 and 1992, after which members were caught up in their own personal drama of marriage, family and career. Third Stage was de-registered in October 2005. 1. No Foul Play, written by Lim Soon Neo and Wong Souk Yee, directed by Wong Souk Yee, performed at the Drama Centre in July 1983. Based on a real-life story, a young woman decides to take her own life when it gives her too much pain and too little joy. 2. Things We Paid For, written and directed by Tay Hong Seng, performed at the Drama Centre in July 1983, together with No Foul Play as a double bill. A middle-class couple finds out after several years of living together that the only things they share are the things they paid for together. 3. Cry for a Cactus, written and directed by Wong Souk Yee, performed at the Drama Centre in January 1985. A young man’s gentle soul grates against the harsh terrain of parental expectations, National Service and social normalisation. 4. Oh! Singapore, written and directed by Chng Suan Tze, performed at the Drama Centre in January 1985, together with Cry for a Cactus as a double bill. An expressionist drama that depicts the progress and transgression of modernity on Singaporean life, quirky and sad, mundane and bizarre. 5. Corebela, written and directed by Chng Suan Tze, performed at the Drama Centre in January 1986. Set in the watery world of Neptune and his wide-eyed and bubble-blowing citizenry, Corebela parodies the government-funded Social Development Unit and ponders the eternal question of whether it is nature or nurture that determines the intelligence of fish and crustaceans. 6. Baby, written by Lim Soon Neo and directed by Yang Siew Mooi, performed at the Drama Centre in January 1986 together with Corebela as a double bill. Falling birth rate has brought about a baby drought in 2010, and a reluctant mother of the 1980s becomes an eager grandmother-to-be embroiled in a hysterical baby grab. 7. Esperanza, written by Tay Hong Seng and Wong Souk Yee, directed by Wong Souk Yee, performed at the Drama Centre as part of the 1986 Arts Festival Fringe. A social realist play on the still raging conflict between Singaporeans and their foreign maids, Esperanza foregrounds issues about what humans are capable of when in possession of almost absolute power over another individual. 8. Oh! Singapore II, written and directed by Chng Suan Tze, performed at the Drama Centre in November 1986. A sequel of sorts to Oh! Singapore. 9. 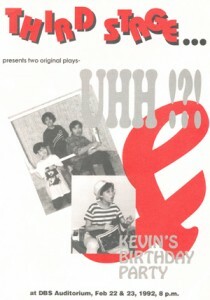 Kevin’s Birthday Party, written and directed by Chng Suan Tze, performed at the Drama Centre in 1991. A monologue about our Generation Zzz – well-to-do, well-fed and well, kids from hell. It is also about children who enjoy birthday parties and adults who don’t. 10. Uhh!? !, written by the collective unconscious, directed by Wong Souk Yee, performed at the Drama Centre in 1991 together with Kevin’s Birthday Party as a double bill. It is all about realisations of some things that have always been stored in the inner recesses of our minds which surface tumultuously in the course of benign conversations and throwaway remarks. Wong Souk Yee is a founding member of the socially conscious and path-breaking theatre group Third Stage. She and four others in the company were detained by the Internal Security Department in 1987 for alleged involvement in a “Marxist conspiracy”.